The Sri Lankan education system is currently experiencing a revolution with the launch of Smart Classrooms. Thanks to this new interactive technology, students are now able to study and gain knowledge the ‘fun’ way, using state of the art interactive board coupled with most current interactive educational software. 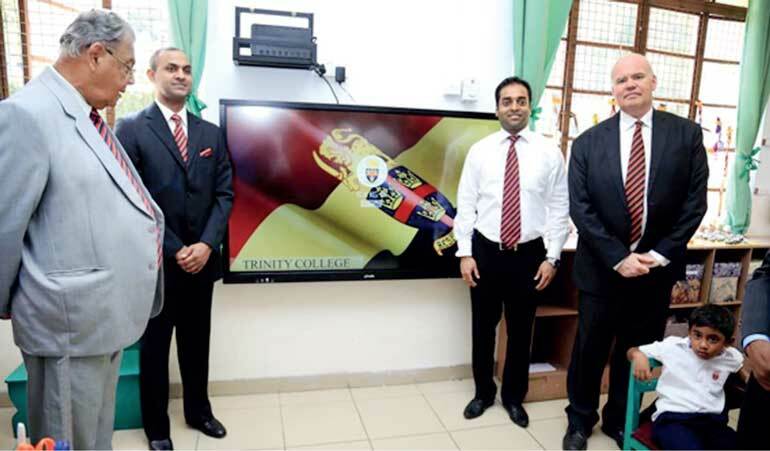 This revolution was experienced by the school ‘on the hills’, Trinity College, Kandy with the launch of smart classrooms. A project initiated and funded by the Trinity College OBA – Colombo Branch, it was launched recently at the Junior School Hall, thus making a revolution in classroom teaching in Kandy. Each board installed in classrooms were ceremonially inaugurated by distinguished old boys, who then invited young students to try and test the all new Smart Board. While this event marks the completion of the first stage of the project, the second stage is expected to commence soon. “Today, we live in the millennial era, where everything is about digital and technology. We understand that this millennial generation are not interested in being ‘spoon fed’. They are hungry for information, curious to learn, and wish to know the unknown. The EWIS Smart Classroom technology, provides our students with instantaneous access to unlimited information and resources; just at the point of ‘touch’. It therefore completely transforms the schools’ educative process, enabling and encouraging them to access, analyse, interpret and apply knowledge to real world situations. “We want to inculcate this quality at a very young age as we don’t want our students to be mere bookworms, but we want them to understand and connect with the real work environment. The EWIS Smart Classroom helps us achieve this objective efficiently and effectively,” stated Andrew Fowler-Watt, Principal, Trinity College Kandy at the inaugural ceremony held amidst distinguished Old Boys, Parents, well-wishers and students. 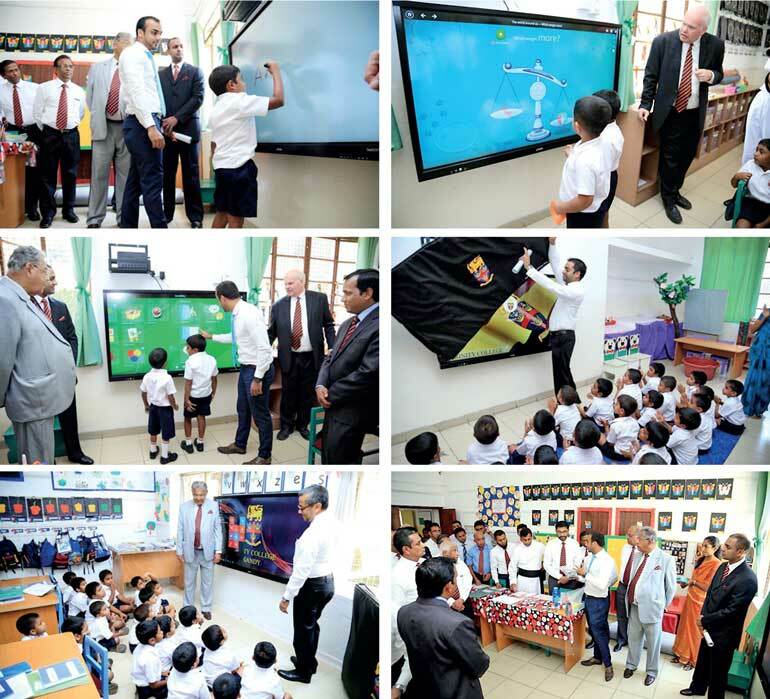 This all new Smart Interactive Display, which is the foundation of Smart classrooms, was installed and facilitated by E-W Information Systems Ltd., a pioneer within Sri Lanka’s ICT industry. This Smart Interactive Display is said to be able to co-exist with the traditional whiteboard or blackboard, transforming the way teachers educate students in a classroom in addition to providing a better and more interactive, learning experience for the students. “A Smart Interactive Display can be used by teachers and lecturers to adapt a more holistic teaching methodology – moving away from the traditional rote method of teaching,” commented Nirmal Pieris, Chief Operating Officer, E-W Information Systems. “With the help of this all new interactive device, teachers can make education more fun, using explanatory videos while writing on it just like they would on a normal board. We are pleased to be associated with Trinity College Kandy and will continue to support the College by way of training in the months to come”. Commenting at the event, Kapila Pilimatalauwe, Project Chairman stated, “In an era where technology is evolving by the day, we are proud to make Trinity College Kandy a leader in the journey in collaboration with EWIS. “The technological landscape is fast changing at a pace that we never expected. It re-invents itself every day. Today, technology paves the way we work, the way we communicate and basically the way the world operates. It is a change that we have to embrace as, it is no more a differentiator but a necessity,” stated Suchitra Aluwihare, President, Trinity College OBA – Colombo Branch. “We want our boys to be ready for this change. While enjoying school, we want them to be ready for that rapid changing world. We want them to be aware of digitalisation, automation, artificial intelligence, IOT and everything new out there. We want our boys to have a scholastic experience and gain competencies that is required to help them not just participate but have that edge over fellow competition in a global digital economy. This is our first step in facilitating this dream as our fellow Trinitians will continue to support the school in any way possible, making it one of the sought-after colleges in Sri Lanka,” Aluwihare commented with pride. The EWIS Smart Interactive Display combines the features of a Smart Television and a Computer. The main features include the 10 Finger Multi Point Touch Facility, with a superior resolution which has the capacity to even play Ultra High Definition videos and multiple ports which can be utilised to connect external displays or storage devices. Based on the customer preference; the device can be provided in three screen sizes (65”, 75” and86”). Since it made its foray into the IT industry by paving the landscape for IT products and services which were relatively new to Sri Lanka, EWIS continues to revolutionise and transform the industry with a reputation for reliability, quality of solutions, teacher training, support services and unparalleled dedication in ensuring customer satisfaction. Over the years, the company continues to integrate its existing processes and enhance value creation across all its businesses as a total IT solutions provider based on its corporate philosophy of being a total IT solutions company, maintaining sincere and strong business relationships to ensure unmatched service standards and most importantly, a passionate and proud Sri Lankan organisation aiming to take education to the next level.